It’s still very conceptual and I don’t claim to have the one and only version of the ELC, but for a start and as a visualization of (my) professional common sense it works well. Update: If you like to have a discussion about this (or any other topic) personally, I will be speaking about this at the Social Media @ HR Summit 2012 in Dublin. @carlssons will join there too. When I was preparing a presentation last week I came across an old slide I have set-up maybe five years ago while still working for Microsoft. At that time I have been challenged with the fact that we needed to turn the employer brand into a more favourable direction while not having much budget (or no budget at all?). Best way to work on such challenge and get a sustainable impact: make PR your second best friend (best should be finance :-)). 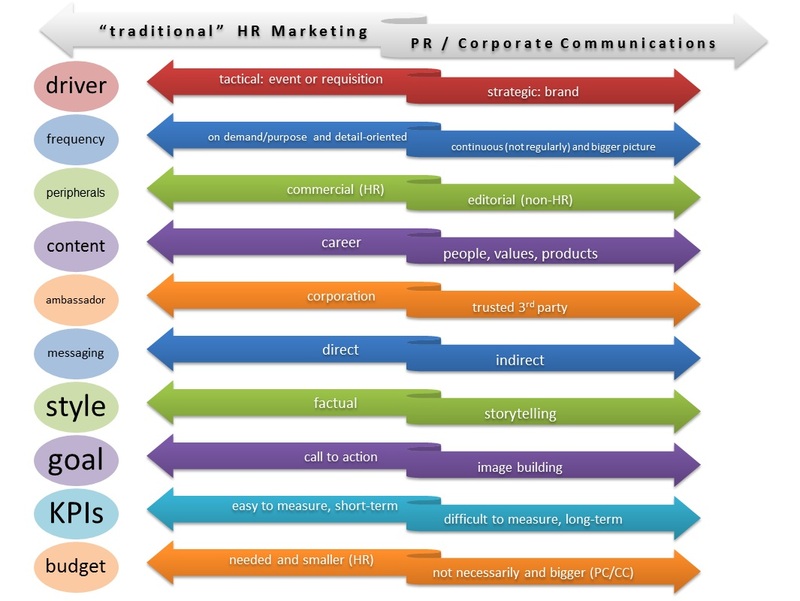 The concept is a little bit outdated due to the development in Social Media but (in all vanity) I still find it a useful slide – for some only to remind you how HR Marketing has evolved over the last years. 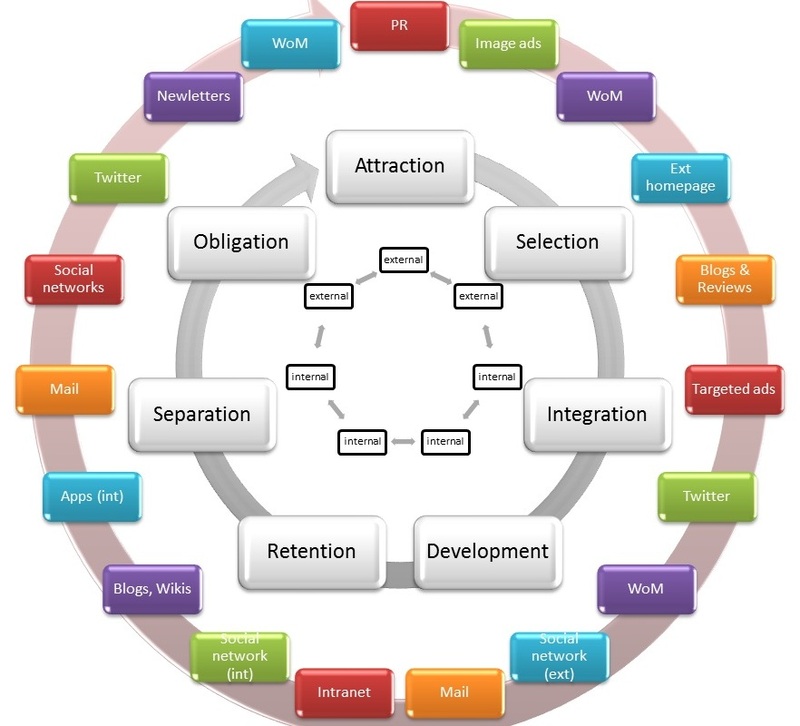 What I want to show are the different areas ‘traditional’ HR Marketing approaches (e.g. job postings, advertisements, fairs) are usually focussing on in opposition to areas where PR is usually stronger. Peripherals: Important for the impact and perception of communications. HRM takes place in an environment where the audience knows that they are approached with a marketing message. Content: HR Marketing is mostly career/HR oriented, while you should try to give the audience something interesting about non-(directly)career linked once you made it to editorial content. Ambassador: second very important attribute for communication perception and impact. HR Marketing is done and communicated by the corporation (or closely related folks), PR is usually though a ‘trusted advisor’, e.g. a journalist. Messaging: direct to the point in HR Marketing (“We want you.”), while rather indirect in PR. It’s more about brand building, not only with relations to employment. Style: Mainly fact oriented with some prosaic elements vs. storytelling with some included facts. KPIs: Easy today to e.g. measure the source of an application, while it’s hard to go beyond vague correlation with PR impact. Mid- to long-term trends should be observable though. I found that a lot of HR departments still only have limited relations with their PR and corporate communications departments. Maybe on if the reasons for this might be the different type of people you find in those two functions. They miss a great chance to make an impact – internally and externally.